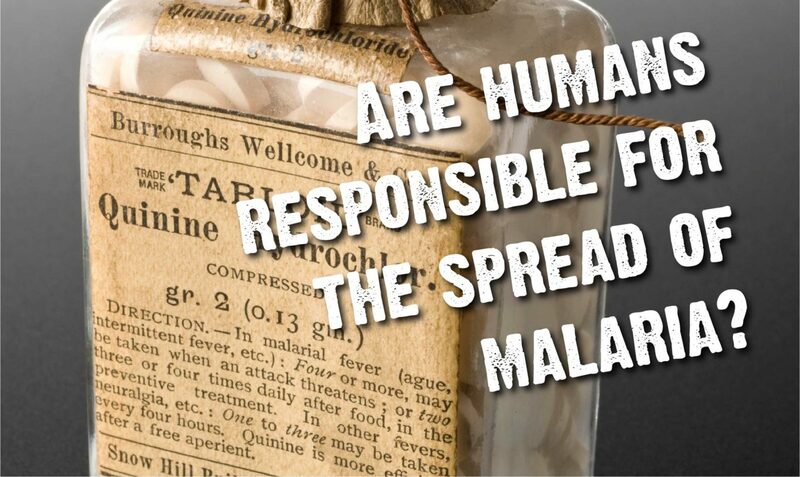 Are humans responsible for the spread of malaria? A hugely important part of the history of our fight against malaria is the (almost Sisyphean) battle against the spread of drug and insecticide resistance. It has been one of the largest causes of the resurgence of malaria in the last few decades1, as formerly highly effective measures become lacklustre or even useless. In order to deal with this issue, we must first understand it. At its most basic level, drug resistance arises through the process of evolution – an antimicrobial drug presents a selection pressure in the same way as changing temperature or a new predator exerts a selection pressure on larger organisms. Spontaneous mutations in the genetic material allow for some individuals to thrive where others remain susceptible to the drug. See this video for an impressive visualisation of the spread of drug resistance in bacteria (credit to Harvard Medical School). These adaptations can take many forms; the pathogen could have the ability to pump the antimicrobial drug out of its cells, perhaps the molecular target of the drug is altered so that the drug can no longer interact with it, or maybe the pathogen begins to produce a substance that can deactivate the drug. In the case of the Plasmodium malaria parasite, this problem first reared its ugly head soon after the introduction of chloroquine as an antimalarial in the 1940s (have a look at last week’s Bug Blog if you want to hear its story!). Resistance to chloroquine spread rapidly in the 1950s, across the areas of the world worst affected by malaria – East and West Africa, Southeast Asia and South America. This resistance can be attributed to its widespread use; so widespread, even, that the majority of the population has detectable levels of chloroquine in their blood2 in certain areas. This extensive implementation exerts considerable selection pressure on the malaria parasite, and thus Plasmodium falciparum is now highly resistant to chloroquine in most endemic areas. This is not limited to chloroquine, either. Until recently, resistance to every class of antimalarial drug except for artemisinins has been observed, including notable multidrug-resistant strains. This includes every single drug mentioned in last week’s blog. For this reason, combination therapy is now the treatment recommended by the World Health Organization (WHO). This involves using “at least two effective antimalarial medicines with different mechanisms of action”3. This has multiple benefits, of which the most relevant to this article is its efficacy in combatting resistance. The chances of resistance to both medicines spontaneously arising are vanishingly small, and even if resistance to one occurs or is already present, the co-drug can eliminate the resistant population of the parasite. The most common and effective combination therapy available is Artemisinin Combination Therapy (ACT), consisting of artemisinin or a derivative (like artesunate or dihydroartemisinin) and a slower, longer-lasting partner drug, like piperaquine. The WHO advises early diagnosis, prompt treatment, considered application and patient-appropriate dosages in order to protect these therapies from burgeoning resistance3. The major causes of resistance can be attributed to three human factors: substandard and counterfeit medicines; unregulated prescription or misdiagnosis; and the use of monotherapies4. These three situations all give the same result: the parasite is exposed to an antimalarial, without complete elimination of the infection. This allows opportunities for resistance to develop and spread through a population. There has even been scattered reports of artemisinin resistance. More recently, and much more worryingly, a team from the Mahidol Oxford Tropical Medicine Research Unit has reported a spreading strain of P. falciparum that is resistant to both halves of an ACT5 that arose in Cambodia, before spreading to Thailand, Vietnam and Laos. As of yet, this has only resulted in delayed parasite elimination and not in total treatment failure (attributable to artemisinin resistance)6. However, the possibility of total resistance emerging, or spreading to Africa, is a risk that cannot be ignored. The issues that antimalarial resistance pose highlight the way that our approach to eliminating malaria has to be multifaceted – mosquito control, bed nets, prophylaxis, education, effective diagnosis, repellents, antimalarials – none of these parts can be neglected if we want to see this disease wiped out in our lifetime.